What a difference a day makes! This was our fourth stay at Huttopia Chenes Verts and we'd never seen it so busy but, on our last Saturday, there was a mass departure leaving the site only about a third full. I think we've always stayed during the last week of UK school holidays whereas we checked in during the second to last on this occasion. It just goes to demonstrate the shortness of the French camping season and why many sites only open for a couple of months. We return to Île d'Oléron year after year after falling in love with its laid-back atmosphere, its miles of sandy beach and network of cycleways. This year it was the only familiar island of the four we would visit over or six-week island hopping adventure. Being back felt like being enveloped in a favourite jumper and we quickly relaxed into our usual routine. Once we'd altered our initial mindset that our week on Île de Ré was going to be a beach holiday we started to enjoy it more. 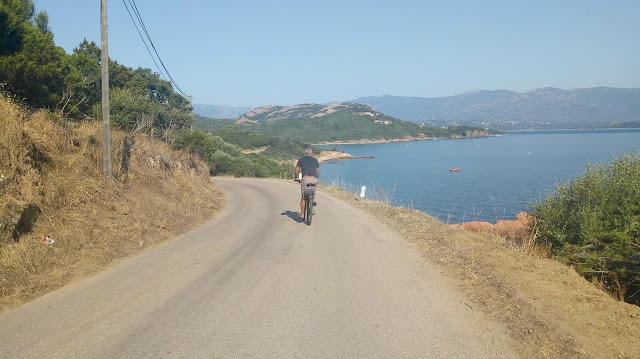 With the beaches either overcrowded or quiet but rocky we decided to cycle and sightsee instead, with a couple of hours of beach in the afternoon. We cycled to all the major towns, Loix and its peninsula a particular highlight. We never did find a beach that was quiet and swimmable. 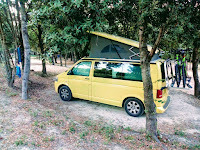 Our campsite is one of two Huttopia sites on Île de Ré and we choose this one for its proximity to the beach. In hindsight I think the other would have been preferable, inland but with a pool. The beach is inaccessible from the campsite and you have to leave the site and walk around to it. Only a handful of pitches have a view of the sea with the rest a boring line of privacy-hedge separated rectangles. As I mentioned in the previous blog post, Île de Ré hasn't immediately endeared itself to us. There are just too many cyclists, the beaches are too crowded and we've also found large sections of the sandy beaches where it's impossible to swim because of vast expanses of rock at the water's edge. On the small sections where there's no rock, sunbathers are packed in like sardines. We were hoping to love Île de Ré as much as we like the neighbouring island of Oleron, but we don't. We always make the best of where we travel to though and so on day two we went back to a beach that showed promise, in Couarde. We were first to lock up our bikes as we'd determined to beat the chaotic bicycle traffic on the cycleways by leaving the campsite early. Settling ourselves well away from the beach's entry point, so we'd not become sardines later in the day, we did the usual beach-day stuff - not really much, apart from reading our books. We left booking our island hopping campsites rather late and then couldn't get the last three islands in their order from south to north. So we ended up on Île de Ré, the island in the middle, first. We booked Huttopia 'Wild Coast' as our campsite because we've been to nearly half of their sites and you know what you're getting. I think this site is a recent acquisition and I have been a little disappointed. The beauty of most Huttopia sites is that you get to pitch on a natural piece of land, pitches spread higgledy piggledy as they'll fit into nooks and crannies of the landscape. On this site a flat piece of land by the sea has been artificially divided into rectangles by privacy hedges. It's not how we like to camp. Cleopatra, Tony and I were greeted like old friends when we arrived for our three-night stay at Domaine Les Gandins in the Auvergne. This was our fourth visit to our favourite French campsite, discovered through Cool Camping in our first year of campervan ownership. Pitching up in the beautiful grounds of an impressive country manor, the river Sioule meandering past, makes for an unrivalled relaxing holiday. On our first afternoon we took a dip in the river and then spent a quiet evening enjoying the warm, fuzzy feeling of being back in our happy place. We made a creamy vegetable stew flavoured with lemon and coriander seed and then took a carafe of wine down to the river. We discussed our plans for the next day and I suggested cycling to Vichy. Google Maps advised it would take one hour and twenty minutes which sounded achievable and I don't know why we haven't considered it on our previous trips. The five-hour ferry crossing from Corsica back to mainland France was somewhat more enjoyable than the outbound journey. Having learned lessons from the first time, once parked on the car deck we quickly grabbed deck chairs on the sun deck where we could enjoy the morning sun and read our books. Nice was a nightmare of traffic and we made slow progress leaving the city but, once back on the motorway, the journey through Provence was pleasant and we arrived in the Ardeche just after 5pm. We spent two nights at a friend's holiday home in the village of St Genies. Cleopatra was given two nights off while we slept in the thick stone walls of a former monastery. Our two-day break from camping would prove to be a lucky escape when 24 hours of thunderstorms battered the region. Rivers burst their banks and 1,600 people were evacuated from local campsites, some by helicopters we could hear overhead. One person lost their life. We found ourselves camping in a vineyard on our last night on the island of Corsica. We'd an 8am ferry to catch and required a campsite or an aire within a short drive of the port. Saint-Florent, on the northern side of Corsica, is just half an hour away from Bastia from where we were due to board the ferry to Nice and it's where we began our search. Traffic on the approach to Saint-Florent was slow moving and the town was drowning in tourists. I'm not sure I'd have wanted to spend even a night in one of its campsites even if there'd been space. With our limited grasp of French we weren't even confident of being able to establish if we would be able to leave a site at 6am and, rather than take the risk, we simply discounted any campsite that had an entry and exit barrier. It was sure to be closed until a more reasonable hour, leaving us locked in and the ferry leaving without us. 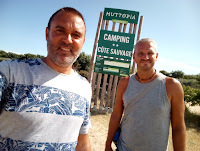 With three nights left on Corsica, we departed from Camping La Chiappa just after 9am intending on seeing some sights before finding another campsite. We wound our way slowly up into the mountains to visit the town of Zonza (plenty of restaurants but unremarkable) and then continued on to Cascades de Polischellu. As we traversed the mountain roads several tourist attractions were evidenced by the long rows of cars parked along the road side for a considerable distance before and after their access points. Many of the tourists had stopped at gorges, waterfalls and rock pools, while others were visiting a church. The waterfall/ rock pools we had chosen were Cascades de Polischellu and we found a full car park there. Luckily it seemed most people were canyonning rather than looking to bathe in the nearby pools.